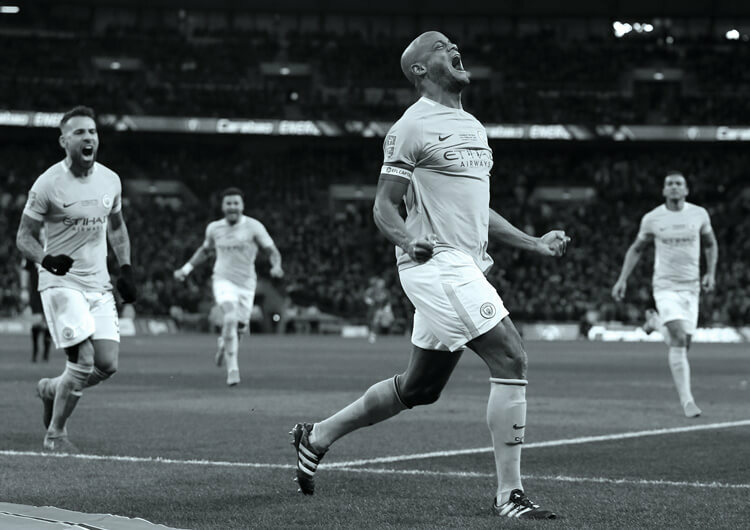 The win that eventually secured a third Premier League title for Manchester City – and a first for Pep Guardiola – was earned with a performance worthy of champions. The visitors dominated Mauricio Pochettino’s Tottenham throughout, taking an early 2-0 lead through Gabriel Jesus and a contested penalty from Ilkay Gundogan. Spurs’ late first-half strike, a fortunate rebound off Christian Eriksen, gave the Wembley faithful hope – but City were again the better side after the break and should have been home and dry long before Raheem Sterling scored a third with 20 minutes remaining. Tottenham set up in a 4-2-3-1 formation, with Dele Alli moving to the left of the attacking midfield trio and Christian Eriksen in the central number 10 role. Harry Kane led the attacking line, supported by Erik Lamela from the right. Tottenham’s early possession was wasteful, often gifting possession back to Manchester City. The defensive unit set up expecting short build-up play from Hugo Lloris, as they are accustomed to. 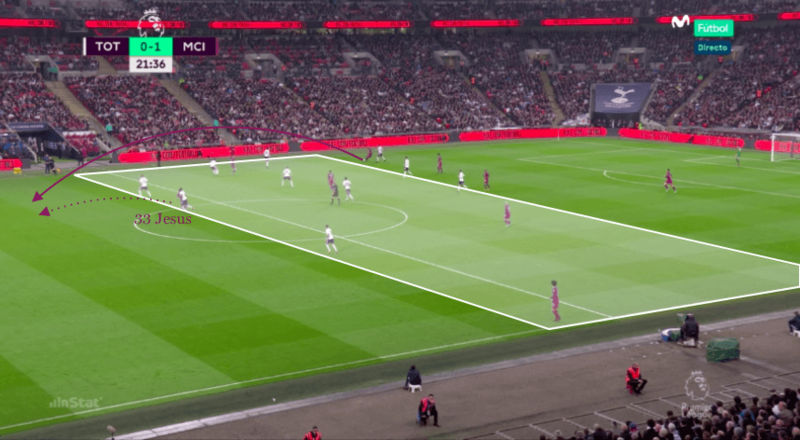 The forward unit stretched Manchester City’s defence, providing additional space around the penalty area for Tottenham to safely build out from the back. However, Lloris delivered multiple long and direct passes forward. With City winning the majority of the first balls, there were no Tottenham players to press the second ball in midfield. 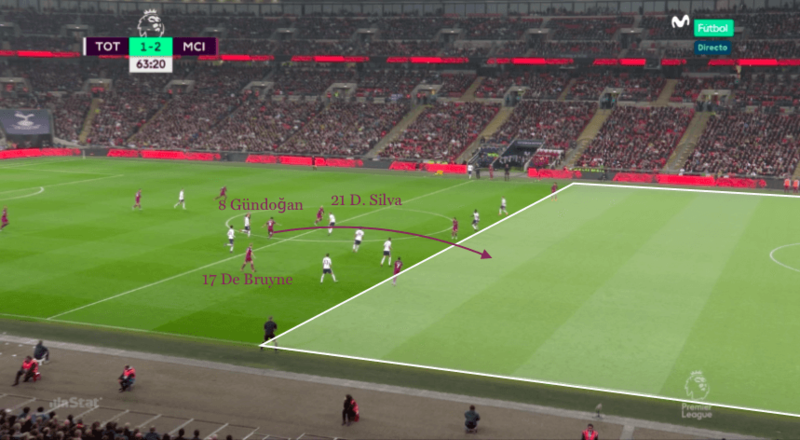 This lack of compactness between the defensive and attacking units also provided the away side with time and space to attack from midfield, with David Silva and Kevin De Bruyne looking dangerous with attempts on the edge of the box. After conceding two quickfire goals, the home side desperately needed to regroup. They began to build short from Lloris, and quickly regained a solid structure when in possession. Despite hardly testing Ederson in the City goal, Tottenham managed to grab a fortunate goal minutes before half-time, with the ball rebounding back off Christian Eriksen into the net. Throughout the second half, Tottenham were much more urgent and aggressive in possession. Both full-backs – Kieran Trippier and Ben Davies – charged forwards, providing multiple dangerous crosses into the City penalty area. For the first time in the match, Spurs looked to take control of the game, becoming much more proactive in possession, rather than reactive out of possession. 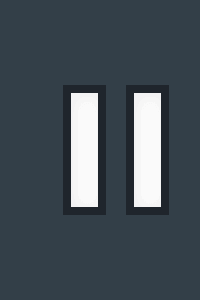 They pushed their back line as high as possible, squeezing the away side into their own half. This, however, left plenty of space for City to exploit, with runners penetrating in behind. The away side duly grabbed a crucial third goal midway through the second half, killing off any hopes of a Tottenham comeback. Tottenham set up in a 4-2-3-1 defensive structure, with Dele Alli on the left of the attacking midfield trio and Christian Eriksen central in the number 10 role. Tottenham set up with a high defensive line for the majority of the game. Spurs had issues early on with their build-up play. The back line dropped deep, expecting a short build, but for most of the first half Hugo Lloris played longer, more direct passes into the forwards. This left the defenders disconnected from the rest of the team. 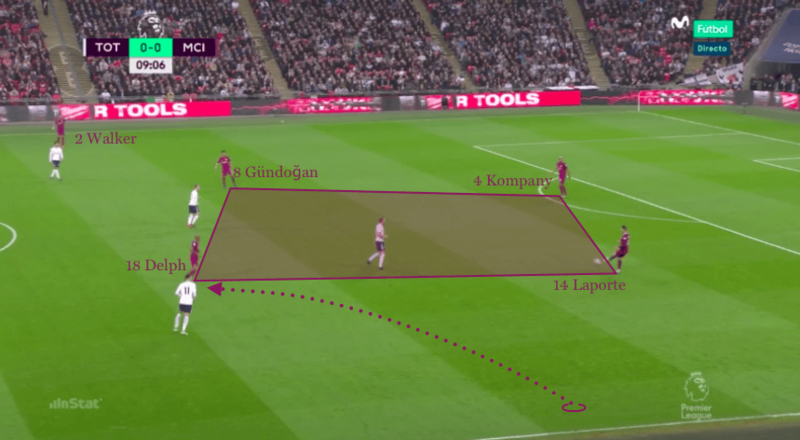 Tottenham's lack of compactness as a whole provided Manchester City with ample spaces to build attacks. The away side won the majority of first balls from Lloris’ long kicks and could recover the second ball if needed, with minimal Tottenham pressure. Tottenham were much more aggressive in possession during the second half. 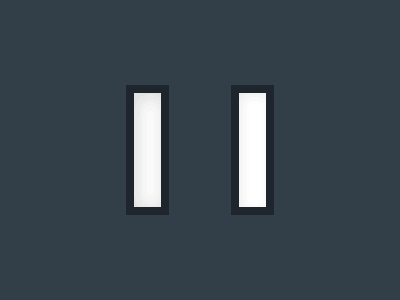 They began to build short much more, and had effective spells of possession. 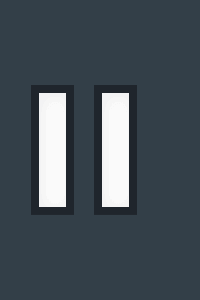 Both full-backs – Ben Davies and Kieran Trippier – pushed higher during the build, and fired in multiple crosses, putting pressure on Manchester City’s centre-backs. Tottenham continued with their high defensive line throughout the second half.  In turn, Manchester City played a more forward and direct passing style, with their pacy front line latching on to clever through balls from David Silva, Kevin De Bruyne and Ilkay Gundogan in midfield. 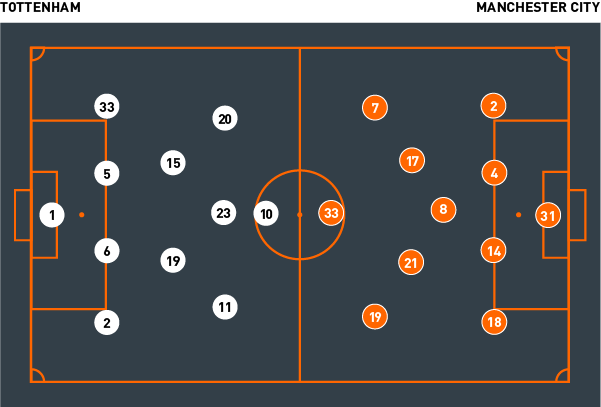 Manchester City set up with a 4-3-3, which converted into a 4-5-1 during defensive transitions and prolonged periods of defending. Raheem Sterling and Leroy Sane often recovered back, supporting their full-backs in the wide areas. 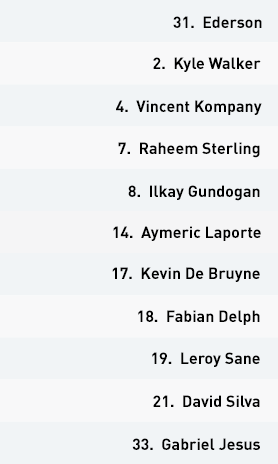 During City’s deep build, Fabian Delph would move infield from left-back into central midfield alongside Gundogan. The away side looked to overload Tottenham’s central areas and build attacks directly through the middle. The home side pushed their defensive line much higher, with their forwards dropping deep. This congested midfield, but City simply adapted with longer balls in behind, using the pace of Sterling, Sane and Gabriel Jesus. Midway through the second half, City changed to a 3-5-2, with Sterling playing much more centrally. If he dropped deeper into midfield, either De Bruyne or David Silva would make forward runs in behind, again exploiting Tottenham’s high line. The visitors penetrated the home side’s high back line time and time again. Sterling and Jesus both had multiple chances to finish the game off, but were somewhat wasteful in front of goal. Pep Guardiola set Manchester City up with a 4-3-3 structure, with Fabian Delph as a false left-back when in possession. David Silva and Kevin De Bruyne played high as supporting attacking midfielders, looking to release the pacy forward line of Raheem Sterling, Leroy Sane and Gabriel Jesus. In possession City built short, with Delph moving into central midfield from left-back. Tottenham reacted to this by aggressively pressing high, as one of the two defensive midfielders – Eric Dier or Mousa Dembele – stepped on to Delph and Ilkay Gundogan. This left David Silva free to receive and drive at Tottenham’s back line. In reaction to this, both Dier and Dembele stepped back to mark De Bruyne and Silva. This left Gundogan free to receive and attack in central areas, leaving Spurs struggling to break up City’s patient build-up play. The home side resorted to a compact mid-block, with the defence stepping up extremely high, thus congesting central areas of the pitch. For a brief period City had no answer and found themselves unable to penetrate, regularly playing all the way back to Ederson. But they soon adapted and built with longer balls over the Tottenham defence, using the pace of Sterling, Jesus and Sane. After all of the away side’s complex and patient possession, they found themselves a goal up from a simple long ball over the top, and a smart finish from Jesus. They continued to search for lofted balls that bypassed the majority of Tottenham’s defensive structure. A few minutes later, a similar ball over the top found Sterling through on goal. Lloris came charging out, missing the ball and taking the man. Gundogan converted the resulting penalty to give City a 2-0 lead. During the second half, Guardiola’s men had to weather surges of possession and attacks from the home side. 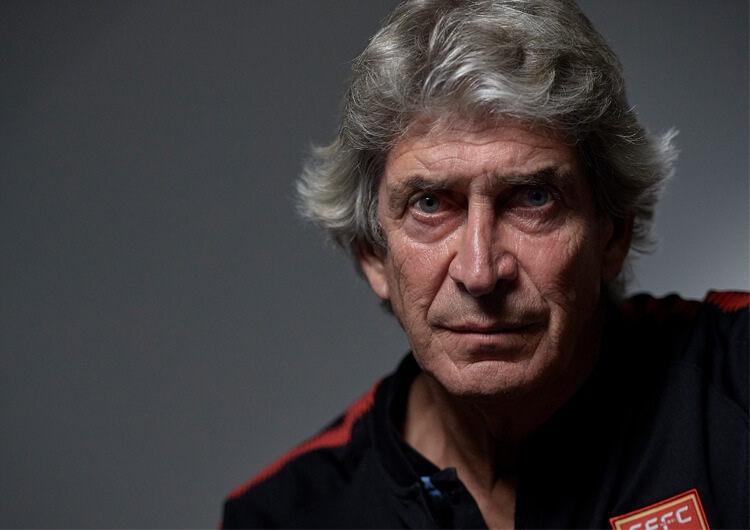 The manager changed his system for a 3-5-2, with Sterling moving into a more central attacking position and Nicolas Otamendi – a replacement for Sane – joining the defensive back line. City exploited Tottenham’s high backline, with well-timed penetrative runs from both Sterling and Jesus. David Silva and Gundogan in particular carved the home side open with incisive passes – but both Sterling and Jesus were wasteful in front of goal, giving Tottenham hope of an equaliser until the former finally found the net with a rebound on 72 minutes. The key battle involved Manchester City’s short build-up play, in which Fabian Delph played as a false full-back when in possession. 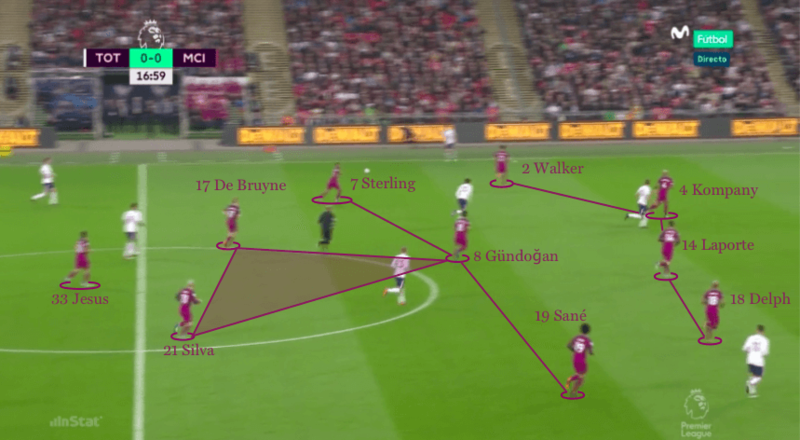 This meant he moved into central midfield any time City were looking to build from deeper positions, in a bid to give the away side an overload in central areas. Tottenham reacted with a high press, looking to win the ball high up the pitch. With David Silva picking up possession in behind, Spurs dropped Eric Dier and Mousa Dembele back to mark the Spaniard and Kevin De Bruyne – but this left llkay Gundogan free to receive possession and drive City forward in central areas. Spurs changed their pressing structure for a third time, with a mid-block in which the front line dropped deeper and the defensive line squeezed up. 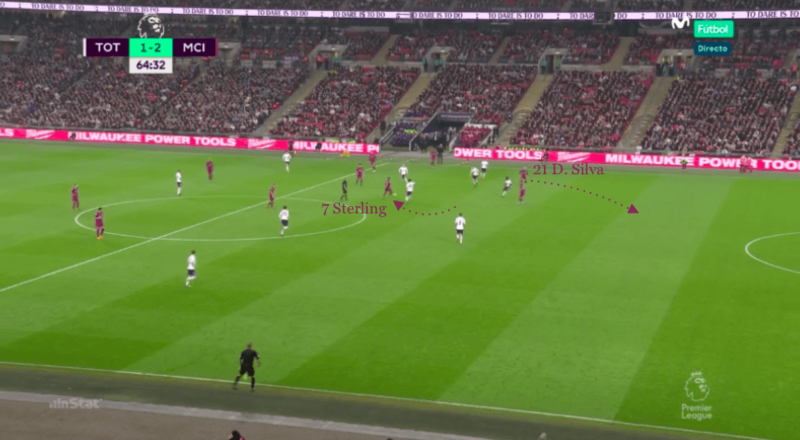 To counter a congested midfield, City switched to longer balls over the home defences – a tactic that led to the two quickfire goals that gave them control of the game. 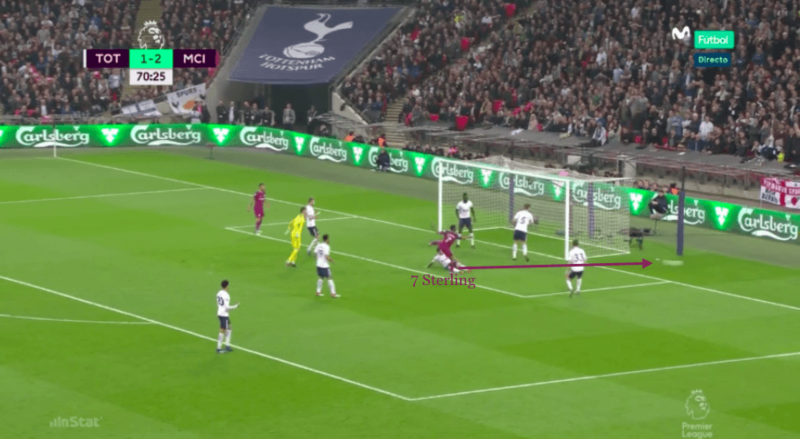 Tottenham persisted with a high defensive line well into the second half, as City continued with more direct passes over or through the defence. It continued to work, and they should have extended their lead a number of times before Raheem Sterling finally netted the third. With Manchester United’s defeat at home to West Brom the following day, this victory earned City the points that would secure them a third Premier League title, and first under Pep Guardiola.